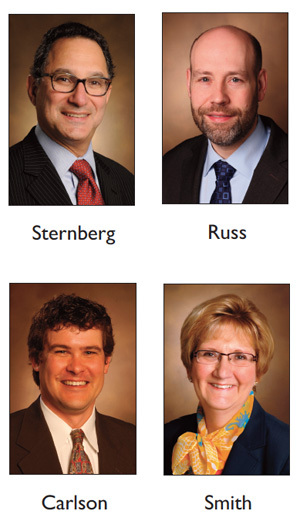 Health care service and access are at the crux of new Vanderbilt University Medical Center leadership appointments. The various responsibilities set out for each of these appointments span adult and children’s services throughout the Medical Center and its many satellite facilities. • Paul Sternberg Jr., M.D., has been appointed Chief Patient Experience and Service Officer. He will maintain his duties as chief medical officer, assistant vice chancellor for Adult Health Affairs, chair of the Department of Ophthalmology and Visual Sciences and director the Vanderbilt Eye Institute. • Stephan Russ, M.D., associate professor of Emergency Medicine, has been appointed associate chief of staff for Access, a newly created role. Russ was formerly associate chief of staff of Vanderbilt University Hospital. • Brian Carlson, MBA, MHSA, has been appointed director of Access and Patient Experience, also a newly created role. He was formerly administrative director of the Vanderbilt Eye Institute. • Gaye Smith, MBA, the former chief patient experience and service officer, has been named director of the Center for Health Information Management, where, along with the center’s medical director, Titus Daniels, M.D., MPH, MMHC, she will oversee medical records, patient privacy and related policies. “These roles are responsible for how Vanderbilt treats patients, referring providers and our affiliated hospitals and clinics,” said C. Wright Pinson, MBA, M.D., deputy vice chancellor for Health Affairs and CEO of the Vanderbilt Health System. “I’m pleased that we’ve been able to call on tried and true colleagues to fill these key positions. “Considering how patient satisfaction correlates not only with organizational competitiveness but also with long-term health outcomes, we’ve joined other top academic medical centers in concluding that it would be best to invest a physician leader with direct responsibility for the patient experience. “As we welcome Paul to this expanded role, I’d also like to thank Gaye for her excellent work as chief patient experience and service officer, and wish her continued success in her new role,” Pinson said. Around the Medical Center, access refers above all to the ease with which patients and referring providers are able to get care and information from VUMC and its busy clinicians. Pinson has long viewed access as the lifeblood of the clinical enterprise. “We’ve come a long way toward improving access, but it could be better yet. The appointments of Stephan and Brian to these roles signal our new efforts to provide the responsiveness demanded by our patients and the referring provider community,” Pinson said. Pinson said new access improvement efforts will first include promoting VUMC’s central phone line for referring providers, and connecting these callers more promptly with Vanderbilt clinicians as needed.